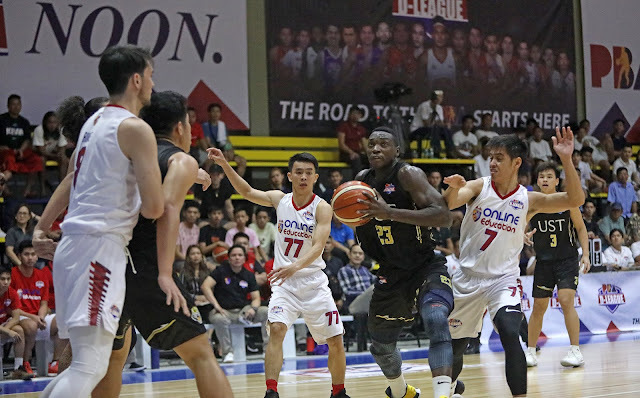 MANILA—University of Santo Tomas rallied on and beat AMA Online Education, 113-108, to stay unscathed in the 2019 PBA D-League on Monday at Paco Arena. Mark Nonoy injected the much-needed energy for the Growling Tigers as he dropped all of his 14 points in the team's 44-point fourth quarter barrage as they completed the fightback from an 11-point deficit, 78-67, in the waning moments of the third period. Soulemane Chabi Yo led UST's attack with 25 points, 18 rebounds, and five blocks, while Sherwin Concepcion added his own double-double of 20 points and 13 boards off the bench. Rhanz Abando and Renzo Subido both scored 19 to help the Growling Tigers move up the Aspirants Group leadership at 2-0. "Our composure was tested. For sure natuto kami rito. Halos ratratan eh, so every time we experience that, mate-test yung decision making ng mga players," said coach Aldin Ayo. It was an admirable performance from Joshua Munzon, who held the fort for AMA with 46 points, the second-most points in a game in PBA D-League history. The top overall pick also added 11 rebounds, six steals, and four assists in the losing cause. Franky Johnson added 21 points and seven rebounds, while Troy Rike had 13 and nine for the Titans (1-1). UST 113 -- Chabi Yo 25, Concepcion 20, Subido 19, Abando 19, Nonoy 14, Lee 8, Ando 4, Mahinay 4, Paraiso 0, Pangilinan 0, Zamora 0. AMA ONLINE EDUCATION 108 -- Munzon 46, Johnson 21, Rike 13, Dela Virgen 10, Tambeling 8, Montalbo 6, Yu 2, Liwag 2, Asuncion 0, Paras 0, Parcero 0, Bederi 0.